A simple example is used to illustrate the principle of mechanical signal interlocking applied as part of the safe working regime of rail systems. This example shows a facing junction protected by two semaphore signals. The right signal arm (3) corresponds to the straight movement through the junction, while the left (and lower) signal arm (1) corresponds to the diverging movement. Three levers control the signals and turnout, lever 2 operating the turnout points. Scenario A shows all levers normal and corresponds to the signals being at danger and the turnout set for the straight movement. Each lever is connected to a tappet which is notched to interact with locks. Lever 1 is currently locked because the lock to the right of its tappet cannot slide sideways because it is blocked by the presence of tappet 2. However, lever 3 is free to move because the lock to the left of its tappet can slide into the notch of tappet 2. By pulling lever 3 into the reversed position, we create scenario B in which signal arm 3 is now showing a clear aspect. Note that now that tappet 3 has moved, it has locked lever 2. Hence, the turnout points cannot be moved (reversed) while signal 3 shows clear. From scenario B, the only possible change is to return to scenario A - all normal. From scenario A, if we leave lever 3 normal, then we can reverse lever 2 to create scenario C. In this situation, we have set the turnout for the diverging movement. Note that the repositioning of tappet 2 has now caused lever 3 to be locked, but it has freed lever 1. Hence, we can now pull lever 1 to show a clear signal for the diverging movement through the junction - scenario D. Note again that the turnout points are locked while the signal shows clear. Click here to download a SigScribe4 file demonstrating this example from The MODRATEC Shop. 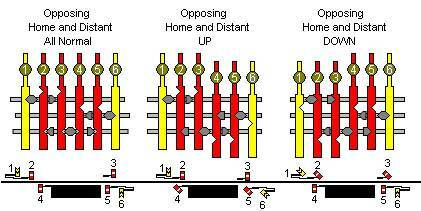 This example was submitted by Steamtostay and shows distant home and starter signals protecting a station location on a single-track main line.